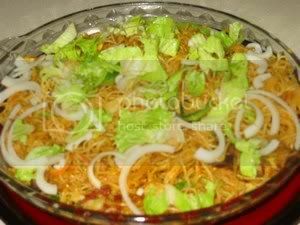 This fried noodle dish is sweet and spicy and the noodle used is the fresh yellow noodles of which is not sold here, so I have to homemade them - refer to fresh homemade hokkien mee from this blog. Heat remaining oil and fry sliced onion, Add in noodles and stir. Add in seasoning. Break in the eggs and stir until egg is cooked. Add mustard leaves and bean sprouts and fry for one minute. Add squid, potatoes, tomato and green chillies. Squeeze half a small lime into the mee and continue to fry until dry. Dish out and serve garnished with chopped spring onions and shallot crisps. no soya sauce or salt is added because these fresh yellow noodles can be salty enough. As the name depicts the recipe, sam in cantonese for 3. Therefore this recipe has 3 types of eggs. Diced the salted eggs and century eggs and put it in a greased 5" x 7" aluminium foil container. Beat the eggs and add in seasonings, add in the water and strain into the foil container. Bring steamer to a boil and turn fire low to simmer. Steamer the eggs until cooked. (there should be no liquid egg when a knife is pierced in the middle). The first time i made Miso Soup with wakamie, the surprise I got when I saw the little wakamie that i soaked became a huge bowl of it. It took me several days trying to use it up, wakamie in my instant noodles, wakamie in almost anything i can think it tastes good. Bring water to a boil. Add kombu and simmer for 5-10 minutes. Add in bonito flakes and bring back to a boil, turn off fire and allow bonito flakes to settle to the bottom. Pour through a strainer and bring soup back to simmer. 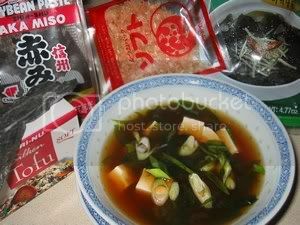 Use a strainer for the miso, dilute into soup, add in wakamie and diced tofu and let soup come back to a boil. This recipe is from the Booklet of Rival Everflex Silicone Soft Ovenware. 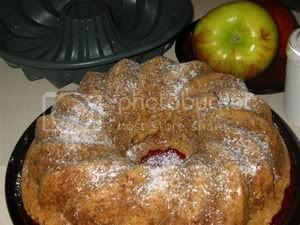 This is a very easy recipe and the cake is delicious and moist. (I have reduced the sugar to 1 1/2 cups). The cake turned out very well using the silicone bundt mould. Combine oil with sugar, add eggs, one at a time. Bake in greased Bundt Ovenware at 325 f(preheated) for 1 hour and 15 minutes. Can be frosted if desired. Place Bundt Ovenware on baking sheet before putting to bake. I made these buns following Jodelibakery and it turned out really good. Thanks Jo for the detailed instructions. Combine all ingredients in (A) in a mixing bowl and knead with a dough hook at low speed. Stop kneading when all ingredients are just combined to form a dough . In an oiled mixing bowl, prove dough for 4-5 hours until surface of sponge dough looks perforated and forms spider- web-like structure when pulled away from edge of mixing bowl. Sift icing sugar and milk powder into a mixing bowl. Add butter, margarine and salt. Beat mixture until light and fluffy. Add beaten egg gradually, a little at a time. Fold in sift flour until a smooth polo skin dough is obtained. Refrigerate skin dough in fridge if it is sticky and too soft to work with. 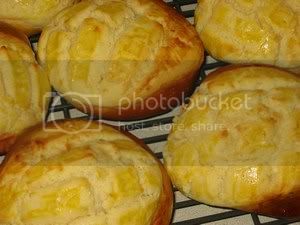 Combine sponge dough prepared earlier and all ingredients (B), except water, butter and shortening, in a mixing bowl. Use dough hook of your stand mixer to knead the mixture at low speed (Speed 1 of Kitchenaid). When all ingredients are just blended, add water gradually and continue to knead until the surface of dough looks smooth. Add butter and shortening a little at a time. Use medium-low (Speed 2) speed to continue kneading dough for about 10 minutes. Increase to medium-high speed (Speed 4) and knead for further 10 minutes. The dough should be elastic, smooth, non-sticky and pull away from the sides of the bowl. To test, stretch a pinch of dough. This dough should form a thin membrane before it breaks. Divide dough into 65g portions. Roll each into a ball and rest for 10 minutes. While dough is resting, divide polo skin dough into 30g portions. Round up. Dust each polo skin with flour and press to form a round thin sheet. Spray water on surface of bread dough. Lightly press polo skin dough on each bread dough so that it covers 90% of the bun's surface. Prove bread for 1 hour or until double in size (it may take longer depends on weather). If the polo skin does not break as a result of the proving, use a knife to lightly draw pineapple skin pattern on the skin. Brush polo skin with beaten egg. Bake in preheated oven at 200 degC for 15-20 minutes. Long proving time stabilises the dough, which in turn enables sufficient hydration of the dough. As a result, ability of dough to hold more moisture is enhanced. Long proving time enables various chemical activities by the yeasts. Bread fermented using this method has better flavour. Bread baked using this method is moist and soft. The stretching gluten network of sponge dough results in larger volume bread. Not suitable if you prefer chewy instead of soft bread. In general for all breads making, the amount of liquid (eggs and water in this recipe) is variable. It depends on types of flour used, type of liquid used, temperature and humidity of atmosphere at the time of making the bread. You may need to adjust the water content of a particular recipe accordingly. This formula is a commercial bread formula. Buns made using this formula stay soft for at least 2 days. However, it is not advisable to knead this dough by hand. It is too soft and sticky to work with. Remember I used to suggest 2-1/2 hours fermentation time in my previous sponge & dough recipes? In this recipe, I increased the fermentation time to 4-5 hours (room temperature), to give better flavour and volume to the breads. There is another approach. If you do not want to wait 4-5 hours for the sponge to ferment, make the sponge before you go to bed a night before you actually want to make the buns. Refrigerate the sponge in refrigerator for about 12 hours. Thaw the sponge slightly before you use it. Sesame seeds, poppy sees, cracked wheat, wheat flakes or dehydrated onions. Put all the above ingredients in the bread machine and choose program that will knead and proof. When proofing is done, place on a lightly floured surface. Divide into pieces (8). Roll each in a smooth ball, making a hole in the center of each with your thumb. Gently pull to make a one inch hole. Place on a greased baking sheet. Cover and let rise in a warm place for 1 hour or until double in size. In a 3-quart saucepan, bring to a boil 2 quarts waters and 2 tbsps sugar. 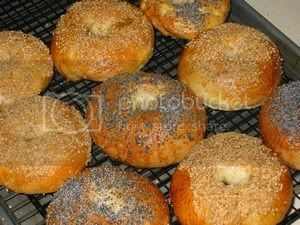 Place a few bagels at a time in boiling water. Simmer 3 minutes turning once. Remove with slotted spoon and put back on greased baking sheet. Brush with egg and sprinkle with choice of toppings. 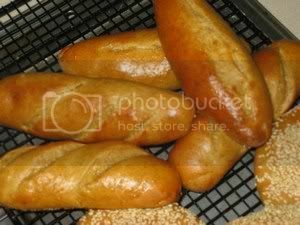 Bake at 400 f/205 c for 20 - 25 minutes or until done, cool on a wire rack. The burger buns and hot dog rolls sold in the supermartkets here are too fluffy and sweet. I prefer to make my own, added raw wheat bran and wheat gluten for texture and nutrition. Put the ingredients in the bread machine following the order from the top. Choose the program that will knead and proof dough. Shape balls and flatten to about 4 inches (these will be for burgers) , roll them flat into oval shape and rolled it tightly like a swiss roll, then shape dough to the size of dog about 5 - 6 inches. Let them proof covered with damp cloth until double. Make slashes for the hot dog buns. 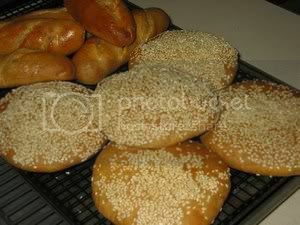 For the burger buns, glaze the top and sprinkle with sesame seeds. 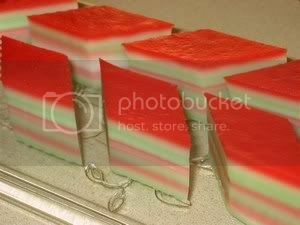 This recipe is an old traditional one which is unlike the new ones which has sago/tapioca flour added, making the kuih very bouncy (ngan). Fresh pandan leaves are not available here, so i have to resolve using pandan paste for flavor and there is no choice of color except green. Combine sugar, water in a saucepan. Bring to a boil to dissolve the sugar. Strain and set aside to cool. Put rice flour and green bean flour into a large mixing bowl. Pour in coconut milk gradually and leave aside to soak for 40–45 minutes. Add salt to the rice flour and mix well. Strain the batter to ensure it is free from lumps. Measure 16 fl ozs batter and add in the pink coloring . Measure another 16 fl ozs batter and add in the pandan paste which will be green. The remaining batter will be red. Place a greased 8 inch tray in the steamer and heat up for 4–5 minutes. Pour half cup(4 fl ozs) of the green batter on the heated tray. Cover and steam over medium heat for 5–6 minutes or until set. Pour half cup of the pink batter over the green layer and steam covered for 5 minutes. Repeat the procedure, alternating green and pink batter until all the batter is used up. Lastly, the final layer which is red. Cool the kuih thoroughly before cutting into small diamond-shaped pieces. Mix the ground meat with the hot sauce. Season the burgers on the outside with salt and pepper. Transfer them to the grill and sear the burgers with the grill top down. Cook for about 3 to 4 minutes, and then rotate to make grill marks, grilling for about another 2 minutes, each time closing the grill top. Flip the burgers and grill for about 2 minutes. Rotate for the grill marks and grill an additional 2 minutes. 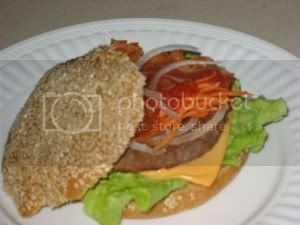 Remove the burgers from the grill onto a plate and rest, away from the heat, for about 5 minutes. This will produce an even, pink burger. Of course if you like it cooked more allow about 3 to 4 more minutes on the grill for each temperature beyond medium-rare that you like. Top with Marinated Red Onions. Cut onions into thick rings, about 3/4-inch thick. Keeping the rings intact, place them in a bowl and cover with the vinegar, red wine, and olive oil. Season with salt and pepper. Gently toss to coat. Marinate for at least 30 minutes, or overnight, if needed. Preheat the grill. Place the rings on the grill and cook for 3 to 4 minutes on each side. Cool. When cool enough to handle pull the rings apart and use as needed. 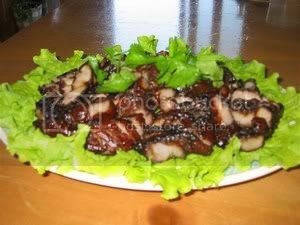 Char Siew is worth making in multiple quantity of this recipe as it can be kept in the freezer for so many other recipes. 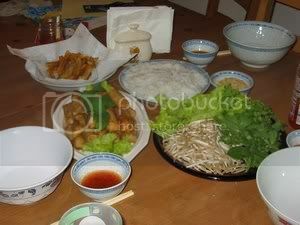 It can be an appetizer, entree, filling and accompaniment to noodles and rice. Marinade pork with seasonings for 2 hours.(optional). Pork can be baked as soon as it is marinated. Line a baking tray or stainless steel dish with aluminium foil. Transfer marinated pork on to it and cover with foil. 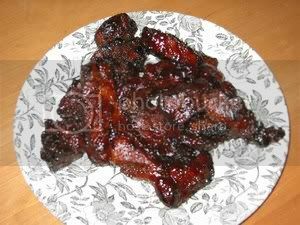 Bake char siew at 220 C/425 F for about 10 minutes. Remove from oven. Open the top foil and bake again until gravy thickens and coat the pork. Alternatively, cook pork together with the marinade in a wok until the gravy thickens. Stir occasionally to prevent burning. Preheat grill and grill the pork until it is charred(not burnt), turning all the time for even grilling. Dip into glaze and return pork to grill just for a short while, enough to give pork a shine. This fried mei fun is called 'sing chow' - singapore. How is it associated, i do not know. If singaporeans can enlighten me, i would be most happy to know. Heat another 2 tbsp oil and fry garlic until fragrant. Add chicken, prawns, char siew , carrot and onions. Stir-fry briefly. Add mei fun and seasoning ingredients. Toss well to combine. Add beansprouts to mix and continue to cook for an extra 2–3 minutes and squeeze in the lime juice. The 'Jin Dui' that i have been accustomed to as a child is like this ones but they are very much bigger. I have realised that alot, very much oil is needed for frying to ensure that the balls get a chance to float to the surface, therefore even expansion of balls. 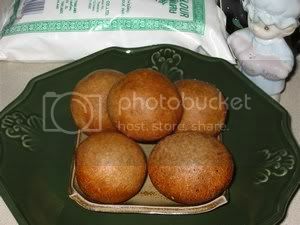 These balls were still nice and crispy even when they are cold and did not collapse. In a wok , pre-heat the oil for deep-frying to 240 degrees F.
Dissolve the brown sugar in the hot water. Place the glutinous rice flour in a large bowl. Make a "well" in the middle of the bowl and add the dissolved sugar and water mixture. Stir until you have a sticky, caramel-colored dough. (it will be white if using white sugar). Cover dough and allow to rest for 1/2 hour. Pinch off a piece of dough roughly the size of an average golf ball or any size you desire. Push your thumb into the dough to make an indentation. Place a small amount of filling (no more than 1 teaspoon) into the indentation , and shape the dough over the top to seal. Repeat the process with the remainder of the balls. Deep fry the balls, three at a time(you may fry as many as you the wok or saucepan can accomodate but do not crowd) in the hot oil(check oil with thermometer and if oil is 240f, add cold oil) . Once the balls start floating to the surface (about 2 minutes), use the back of a spatula or a large ladle to gently press the balls against the side of the wok . Continue applying pressure to expand approximately 3 times(desirable size) their normal size. and fry balls till golden brown. When the balls have reached maximum puffiness, bring up the heat to finish browning. Drain the deep-fried balls on baking rack then transfer to paper towels. 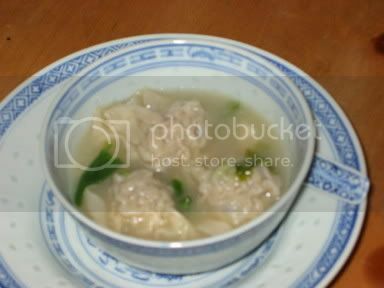 Wantan soup is a accompaniment for a dish of egg noodle which has plain sauce of black and light soya(in cantonese - kon loh). This plain sauce is most common among the hawkers in malaysia. The fillings for the wantan too can be any meat or just prawns alone. Mix the filling ingredients with the seasonings and leave in the fridge for 30 minutes. Place one teaspoon of the filling in the centre of each wantan wrapper. Put in wantan in batches to cook. Remove when done. Bring the stock to boil, add in choy sum and then the cooked wantans. Add a dash of sesame oil and chopped spring onions/cilantro to soup before serving. The wantans can be deepfried but the way to fold is different for better presentation. 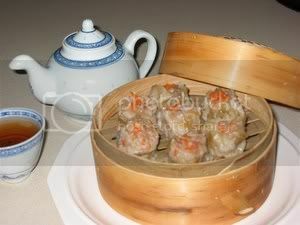 When we go for Dim Sum, Siew Mai tops the list in our orders. A good Siew Mai must have a very thin wantan skin and the meat should be juicy and crunchy, then it really touches the heart and that is how it should be in Dim Sum. Combine (A) in the stand mixer bowl. Add in seasoning ingredients and combine well. Using the paddle ,turn on medium speed and mix it is sticky. Refrigerate mixture for 40 to 60 minutes. Put two teaspoons of the filling in the centre of each wantan skin. Gather the edge of the wrapper together so that only the top of the filling is seen. Place dumplings on a greased steaming rack. Sprinkle the top of each dumpling with salted egg yolk. I was introduced to this vietnamese dish only when i came to stay in Denver and the whole family loves this dish very much. One sunday, my son-in-law, jeremie, wanted to have egg rolls in a vietnamese restaurant we frequent but it was close on this day of the week. So, since i have all the ingredients and thanks to tt, our dear forum member, who has posted this recipe, decided to have a go at it. Peel and shred carrot into thin strips. Chop onion into little pieces. 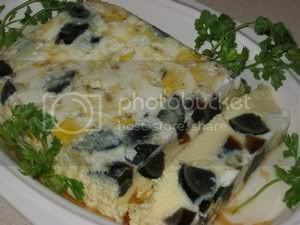 Soak black fungus and slice into thin strips. Cut noodles into ‘shorter’ pieces. Put filling in the middle of wrapper and fold in the 2 sides, then roll together (like making egg rolls) put a little egg yolk at the end to hold the spring roll together. For every 2 cups of oil add the juice of ½ a lime or lemon, or 2 tsp vinegar. 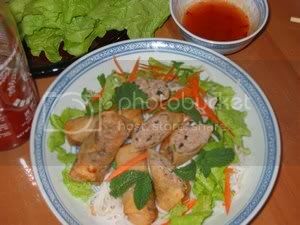 Add sprDipping Sauce for Spring Rolls:-1/2 cup sugar-1/2 cup fish sauce-1 1/4 cup water or coconut juice-3 cloves garlic-thai chilies (as spicy as you want)-1 lime*Mince garlic and chilies. Mix everything together and squeeze in lime juice. All flavors (salty, sweet, sour, and spicy) should be ‘equal’. Can replace fish sauce with soy sauce if you don't like the smell of fish sauce. ing rolls into oil, and fry until golden. Frying time should take about 15 mins. If it is golden before that time, the oil it too hot which means, the filling might not be cooked, and spring roll will be soft when cooled. Mix everything together and squeeze in lime juice. All flavors (salty, sweet, sour, and spicy) should be ‘equal’. Put rice vermicelli on a plate or bowl. Fritters are one of the favorites for afternoon tea. The most popular of the fruits used is the banana. Cempedak fried in this way is delicious. Sweet potato and taro(yam) although not a fruit, fry very well with this batter. Combine the various flours, salt and baking powder in a mixing bowl. Pour in water and combine into a batter. Add in oil to mix. Rest batter for 1/2 hour. 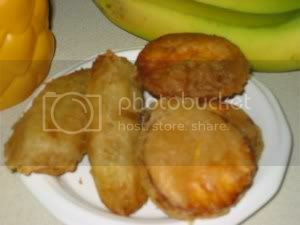 Coat banana halves, sweet potato and taro slices in batter and deep-fry in hot oil until crispy and golden brown. Remove and drain on baking rack and then with paper towel. Noodles can be made from all sorts of ingredients and the shape should be long although thickness varies. 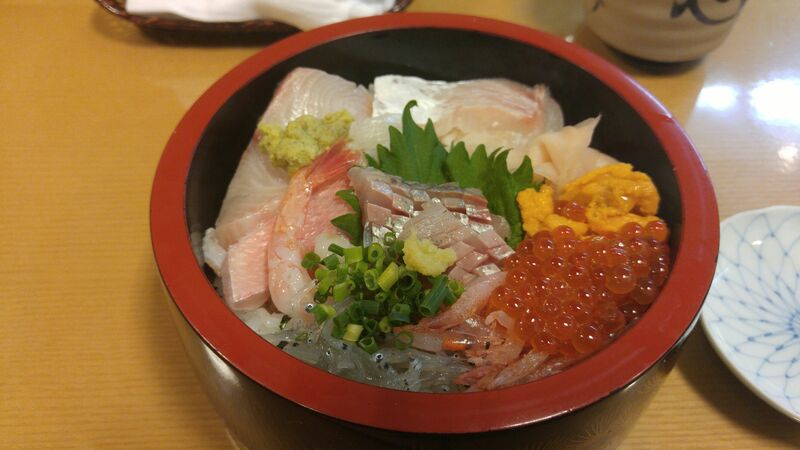 The hokkiens are noted to make this type which is made with wheat flour. There are so many varieties of wheat flour noodles available here in the oriental stores but this kind that we like have to be homemade here. There are many favorite noodle recipes that use this hokkien mee e.g. 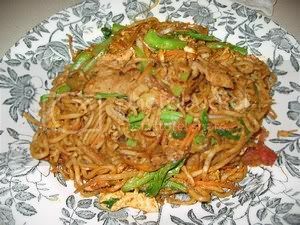 curry mee, mee goreng mamak, mee rebus, mee hailam(hainanese fried mee), mee yoke etc. It differs from the 'sang mein' or 'wantan mein' which is uncooked and hokkien mee is thicker, size of spaghetti. For the Black Hokkien Fried Mee, the mee is made into 3 times the thickness. Sift flour into food processor(use the plastic blade) and add potassium carbonate & sodium bi-carbonate solution(kan sui) and salt. Add in 100 ml water and pulse a few times, continue adding the rest of water little by little and pulse, as soon as dough is in pea size crumble, stop adding the water. Knead dough on a lightly floured surface dusted with plain flour. Roll out and flatten dough into rectangular shape, then cut into four equal pieces. Dust each piece with tapioca flour lightly to prevent sticking. Cover the pieces with a clean dry tea towel. 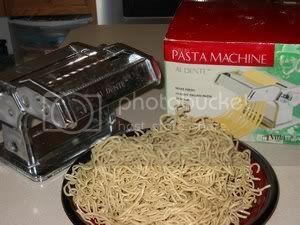 Heat a big pot of water, when water boils, add 2 tsp of salt then a handful of noodles. Stir gently and when noodles float to the top. Scoop up with a spider strainer into a colander, rub cooking oil into the warm noodles. Place noodle into a baking tray to cool before packing. Finish cooking the rest of the noodles. The noodles are now ready for use.